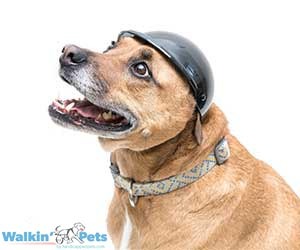 The Walkin' Dog Helmet allows your dog to have the ultimate head protection that is lightweight, allowing the dog to remain both safe and comfortable. Perfect for dogs with vision loss or other issues that might cause them to bump into things, these helmets are made of durable material that is light and easy to attach so your dog can do all the things it normally does safely. Protective - The helmets hard outer shell gives your dog a safety barrier between their head and any outside objects they could knock into. Great head protection for dogs with cerebeller hypoplasia. Comfortable - Inside the helmet, there is adjustable padding to provide the utmost safety and best fit. It is attached with Velcro in case the inner padding must be adjusted or even removed for a better fit. Adjustable - The helmet straps are fully adjustable to tighten or loosen to comfortably secure the helmet into place. Remember, the tops of dogs’ heads tend to be smaller than ours because of the way we are structured. The helmet is too big if it is able to slide toward the neck, let alone cover it. The straps may need to be tighter than you think. Use the same rule that you would use on a collar: If you can fit two fingers through it, then the dog has enough room to breathe and take it off in case of an emergency. Circumference (B): Measure from across the forehead to around the back of the head. If the dog's ears are floppy, measure around the ears. If the dog's ears are straight up, fold them down to include in the measurement.